The first experience was amazing. I was running around Green Lake in my already well worn Luna sandals when a voice from somewhere deep simply made a request, “take them off.” I did. And what followed was a life-altering 3.2 miles of overwhelming bliss. And if this sounds like a bit of an odd thing to say about running around a rather mundane urban lake smack dab in the middle of metropolitan Seattle I shall take no offense. Little old Green Lake thrives with a host of known and unknown diseases and the path around it is littered with a small forest of signs warning local fishermen not to eat anything they catch out of it. It is an urban lake with no outlet and has been crapped in by water foul and human foul for hundreds of years. On warm summers it gets a smell that you don’t want to be downwind of and if you swim in it your skin starts to peel off. Barefoot running is something I’ve been doing for over a year now. I’m finding that it has intersected my life at one of those watershed moments, one of those titanic shifts in my emotional and spiritual identity. Like a change in seasons this periodic shift seems to rewrite and redefine my sense of reality every 3-5 years or so. I don't care if it sounds cliche but with every refresh colors get richer, the smells more potent, the sights more awe-inspiring. And in this new super-saturated Matrix I begin to fantasize that my will has beaten down the very laws of gravity, as if like Neo I shall in the next moment only will myself to jump a dozen feet in the air and find that is in fact a very easy thing to will and then to do. The fantasy used to fade rather abruptly but in the last few years it seems as if I’m closing in on actually making that leap. 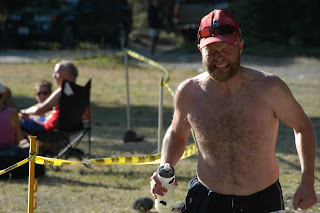 Three weeks ago my buddy Chris and I ran the White River 50 up near Crystal Mountain Resort Washington. For Chris it was something big he wanted to do before he had so many hungry faces to feed at home that he would never again find the time to train for such an event. For me it was a chance to hang out with my best friend who is now somewhat harder to nail down between his lawyering and his parenting duties. 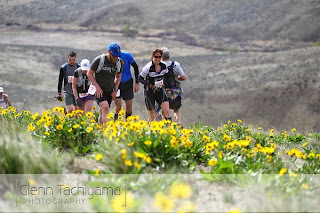 That and only three weeks before we’d decided to take our one and only training run traversing the entirety of Rattlesnake Ridge to see how we’d hold up over 23 miles of open trail and several thousand feet of elevation gain. For the most part we both found we felt great and for my part I felt like I could easily double that distance and pull off a 50. Even more encouraging I’d slept but 3 hours the night before, was dog tired, felt slightly nauseous, and had a huge fresh blister on the meatiest part of my forefoot. Still every mile of trail found me feeling better and better. It turned out that running 50 miles was easy. I make no claim to be superhuman and I’m certainly not insane. I don’t even run very much and I don’t have any aspirations to be as hard-core as barefoot Ted. But 50 miles was easy. Sure I sobbed a little at the end but I still claim it as a cake-walk. What is more it was thoroughly enjoyable; it felt like the best birthday present I could have given myself. ALL the people there were fun and supportive, the support staff was inspirational, the friends I met were fascinating, the scenery inspired worship, and most of all I found myself feeling really really good. I was content and I was happy. When I say it was easy I mean to say that in comparison with merely existing a day in my life 10 years ago, it was easy. Running 50 miles today requires a fraction of the mental strength getting through a day of watching TV, eating and breathing took 10 years ago. 10 years ago I was coming near the end of 20 years of chronic and deep depression. I was near to coming out of a long long sleep, a cold wet coma I’d wrapped myself in to escape the horrors of my childhood. My transformation into barefoot running bears a striking resemblance to my spiritual and psychological transformation in recent years. Like discovering my first therapist, testing out a pair of minimalist shoes and learning to toe strike felt immediately good and beneficial. Those first miles of running more on my toes than on my heals felt like an immediate revelation. Sure my calves were aching from the strain but all my normal aches and pains were eerily absent. Naturally what felt so good bore repeating. I never went back. Never again would I don my traditional well-supporting running shoes from Super Jock and Jill. Don’t get me wrong. I am no evangelist or a part of some new fad (though I might fairly be accused of both). I was running barefoot-style for over a year before I even bought that now famous book Born to Run. No, I returned to the toe striking simply because I was paying more and more attention to how good I was feeling. While I’ve kept up running ever since high school mostly because of the health benefits I’ve derived from it, running has never been without a lot of pain, and never actually all that much fun. Now running felt more natural and pain free. With much less support and much lighter footwear the ground was making its presence known to me. And I found out that ground is hard. Rocks, concrete, pavement, grass, some of it is softer than other parts but basically it’s all hard. It doesn’t feel good to just flop down on it willy nilly. And yet I’ve come to see that all the years of running with soft cushiony footwear was more akin to diving head first into an empty concrete swimming pool. As I my foot was getting closer to the hard realities underneath it, I felt lighter and freer on my feet for it. My posture began to change. Almost immediately I found myself standing and running more upright. My back and joint pain was lessening by degrees. Perhaps not coincidentally as I learned to pay more attention to the ground I was also paying more attention to what I was eating. Enjoying the natural bounty of markets like Whole Foods and PCC I began eating more whole foods and increasingly raw foods simply for one reason. I lost thirty pounds and I wasn't even trying to diet. It felt good. I like things that feel good. Sometimes too much. In addition to my past chronic depression I am also an addict, not beyond hope but an addict nonetheless. Beyond my currently arrested addictions my compulsiveness at times still makes itself known. Don’t leave a gallon of ice cream in my freezer and expect it to be there next week. And don’t leave a pack of smokes on my kitchen table either please. Suffice to say, I really really like things that feel good, things that provide exceptional relief and pleasure. So eight years ago when I discovered that this thing they call ‘health’ also feels good and pleasurable I dove in high hog. In my running I graduated from Brook's Green Silence shoes, to several pairs of Vibram Five Fingers, to Merril Trail Gloves, and now to Luna Sandals. The latter two are currently my favorite running choices, the Trail Gloves unexpectedly being even more ‘natural’ feeling and ventilated than the Five Fingers. And then this week I went naked for the first time. I don’t know how far I’ll take it but one thing is for sure, the determining factors are my overall health and well-being. Plus it's not all that fun to be stared at for an hour at a time whilst running around the green lake. Still it feels really really good. I’ve kept it to the relatively safe and glass-free confines of the Green Lake path but we shall see. But seriously, who would have thought running barefoot on gravel, dirt, and asphalt would be infinitely easier and feel better than running that same path in a pair of large cushiony shoes? Not me. But now I am the convert and the evangelist. And I am okay with the contradictions. And last week I bought the book even as I now feel this has become an identity of mine: I am Born to Run.